Herbalism has a fascinating history with many legends. Perhaps one of the most interesting legends is the story about the Vinegar of Four Thieves. Apparently there is some truth to this and people have used the recipe throughout the centuries claiming this vinegar is powerful. So, what is this fascinating legend? Between 1339 and 1351, a pandemic known as the Bubonic Plague or the Black Death traveled from China to Europe killing one third of the world’s population. In Marseilles, France, four individuals took advantage of the Black Death and ransacked homes of those who lost their life to the plague. These four men stole many possessions from the deceased and got away with their crime for quite some time. Eventually police caught up with the thieves and they were brought in front of French judges. In the body of the court, the judges expressed bewilderment. They asked the thieves how is it they went into so many plague-infested homes and did not take ill. The reply was simple – throughout the day, every day, the thieves drank and washed with special vinegar. The judges were in awe and made a deal – in return for the recipe of this vinegar, they could have their freedom. This was a deal the thieves could not pass on so they accepted. There is some controversy as to what the original recipe is but many experts believe that the Vinegar of the Four Thieves is the original. Over the years, this antibacterial and aromatic vinegar was used for washing sinks, walls, bathrooms, and so on, to help sterilize a home in which the flu bug exists. Original recipe or not, many people seem to feel this is a great remedy – and house cleaner. 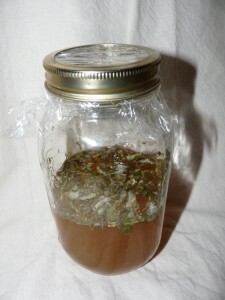 Externally this vinegar has been used in small proportions in a bath or diluted as a body wash. The reason it is diluted is because the combination of herbs is powerful for most people’s skin. Internally, those with a cold or flu take one teaspoon diluted in a cup of water, never exceeding three teaspoons in one hour. If anyone nowadays wants to try this, it is strongly recommended that they speak to a health practitioner before self-medicating. And there you have it! A very interesting piece of history that just might cure the common cold and keep away flu! this is interesting. your website is really amazing – i love coming here regulary! keep up the good work! Even this new generation we still use herbal supplements. I think that most people are choosing herbal supplements now a days.